Someone is killing off Virginia Linford's finest company executives. Linford has assembled a training camp for her elite, on her own private island, Valkyrie. But someone doesn't want them to finish... A cruel and sadistic killer is methodically and brutally killing each candidate, and the quest for power becomes a struggle for survival. With no contact with the outside world and the killer closing in, will anyone survive? And why are Linford's brightest being killed? No particular Christian or moral message in this one; just a thrill-ride from the moment the action starts to the unexpected and shocking end! The best of Linford Industries executives gather together at the behest of their boss, Virginia Linford, on her own private island, Valkyrie. Their mission - to train and work together to find who will be the best, smartest and the toughest in every facet of life. Their goal - the three most successful candidates will gain the honor of going on to lead Linford Industries' three main international companies. The competition will be tough, and they all know it. But as the candidates begin to compete for the highest positions in Virginia Linford's company, they quickly discover that they are not alone on the island... Another sinister presence is lurking. As their cruel tormentor systematically stalks each candidate, and as the body count rises, the question becomes - who will be next to die? None of the men and women present are safe! And so the quest becomes simply to survive! Read as the idyllic setting of "Valkyrie, the island paradise" becomes "Valkyrie, the blood bath". The hints are all there - someone should have known the identity of the killer! You should know! But can they work it out in time for anyone to survive? Can you? If you want blood, action, destruction and tension, with the added pleasure of trying to identify the killer before it's too late, this novel is definitely for you! You may guess the next victim. You may even guess how they will die. And if you're very lucky, you may even work out who is killing Virginia Linford's finest and brightest. But you'll never guess the final twist! Truly, this will leave you gasping for air! There is no particular message in this novel. Most times I try to include a Christian message, but this is one of my earlier novels, and I think it's just a lot of fun how it is. Perhaps someday I'll change it to include a message, but for now, just enjoy the thrills, macabre action and the ultimate pleasure of trying to guess the identity of the hidden killer... Enjoy! "Shhhh," insisted the whispering voice. "No more. You're a good girl. That's enough. Shhh. I don't want to hurt you." ??? let go an audible sigh as the arm that crossed her chest began to pat her right shoulder, and her tenuous relief was evident to both. She shivered, again strangely mindful of the need to remain calm, and even to excel in the midst of what might simply prove to be a macabre test. ??? seemed dead enough, she thought. He had to be dead. This couldn't be faked - could it? Her eyes danced around the lonely, cold shed, coming to rest again on the silenced automatic still resting safely on the table across from them. ... (the) killer moved in so close to ??? 's right ear that she could feel the warmth of the stranger's breaths on her cheek. She braced herself, determined not to shudder and therefore show how terrified she really was. Her composure, however, was tested in another moment when she heard the voice whisper in a quiet and sympathetic tone. ??? 's attacker stood with her, facing her, cuddling her as though comforting a friend. She felt warmth, then an horrific emptiness, and a short time later was aware of the rope tightening even more about her throat and of her feet being released and free. She felt something else too. It was hideous and sickly, and yet her mind would not yield and allow her to pass into unconsciousness to find relief, even when the worst of the pain had subsided. And while sexual assault had clearly not been the intent of the attack, this brought her little comfort now. ??? heard the tape being torn free from her ankles. She was fully aware of her punishment, and could feel something bumping her feet as they now kicked about in freedom above the grass. She turned her eyes out to sea, unable to deal with the torture of both mind and body and she knew that she was being disemboweled. The intruder stood still, staring at ??? as though he was a mortal enemy, about to be dealt a decisive blow. ??? watched in dread and wonder as the masked head pressed against ?? ?, cuddling her and pushing her closer to the edge of the sinking Mermaid. The intruder's left hand remained clamped over ??? 's sweating forehead, and the thick, visible lips within the mask touched her small ear, and ??? knew that the fiend was whispering to her. He watched the face of the one he loved react to the words spoken to her, her face lighting up, her blue eyes wide with surprise. Those deep blue eyes stared back at ?? ?, conveying love and pleading to him for rescue. ??? loved him, and ??? knew it. Jenny did not hear the cracking volley over the roar of the plane's engine. In her almost delirious state she remained oblivious to the destruction being wrought by the bullets. The series of high-powered projectiles whistled toward the end of the dock, wreaking death without Jenny ever being aware of them. ???? 's mind finally snapped into action, a desperate understanding of the need to act giving her increased impetus. Strangely, and to her relief, once she stood and exposed herself to the likelihood of gunfire, fear no longer mastered her. While she found herself driven and shaking with thoughts of self-preservation, she found that her mind handled her fear, and that she could think more clearly. She too thudded hard against the timber wall of the closest building, then peered around the corner, wondering where to go next. Adrenaline pulsed through her veins. No point in waiting, she thought. She ran from the safety of the corner into the open, intent on running until she could reach the safety of the next building. The power of her conviction to run, though, was not enough. ??? heard something explode, and in the madness of the moment, she felt sure that it had been inside her head. Whatever it was, it was louder than the earlier shots, and deeper. Much deeper. The best of her intentions to save her friends dissolved, and ??? was flung heavily to the sandy ground and she slid along in the dust. Stone despaired as he waited desperately for Nick and Jenny to run from the flames, and felt himself giving way to hopelessness. The explosion of fuel, smoke and fragments renewed its effort, snarling and bellowing again as more fuel ignited and the dying beast sought to consume its prey, and neither person appeared from the fiery, orange ball that followed. He was screaming, crying, the tears clouding his vision as he begged Katrina to regain her composure and to save herself. For the moment the killer was clearly intent only on tormenting Stone, the pistol never targeting anything but his forehead. Katrina's body remained facing the killer, but she turned again to Stone, fretting for him, and either unwilling or unable to run. Stone stared into the cold barrel, waiting for death. It was over, he knew it. A single and deafening crack exploded from the muzzle of the automatic, and the explosion bellowed and echoed through the surrounding trees and grass. ??? drew a deep breath, her spear dropping silently to the grass near her feet. Then she fell slowly and gracefully backwards, dropping almost without a sound to the thick, soft bed of woven grasses beneath her. 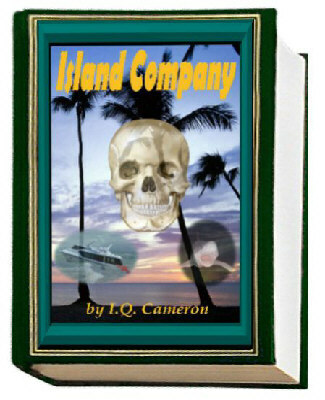 Purchase the surprising conclusion to Island Company.